Some online slots hide their complexity behind a simple facade – the design might be basic but look under the covers and there are extra features to tempt us to part with our cash. Sticky Diamonds is one such game, it’s developed by Gamomat and it combines a fruity theme with some nice extras which you read all about below. 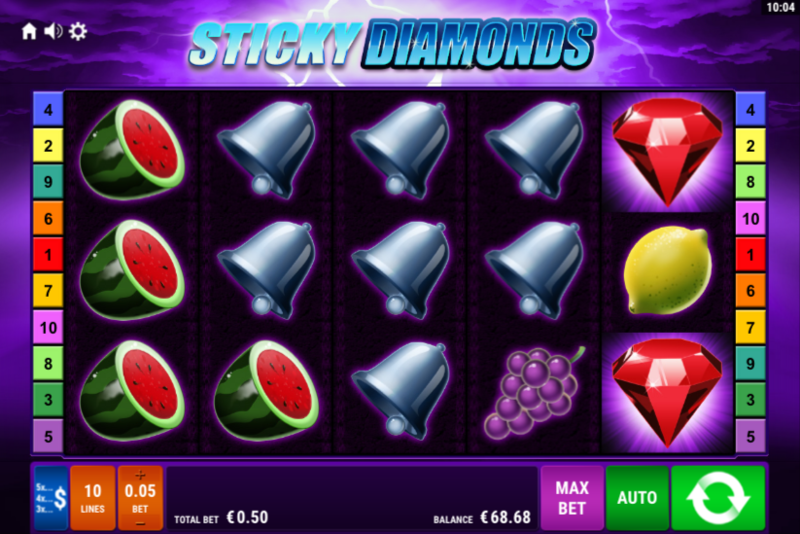 Sticky Diamonds is a five reel slot with three rows and ten fixed paylines; the nicely-rendered fruit symbols spin on dark reels while the dramatic backdrop features lightning strikes in a cloudy, purple sky. Most of the symbols are traditional and include a glowing seven, watermelons, grapes, oranges, plums, lemons and cherries. These symbols can appear stacked on the reels. The wild symbol is a large red, glowing diamond and it replace all others except the scatter – that’s represented by a large lightning strike which activates the main feature. This is triggered by landing three or more of the lighting scatter symbols anywhere in view for which you will receive the slightly odd number of 11 free spins. The way to make money here is to land wild diamond symbols because when you do they will freeze in place for the rest of the round – as you can see from the video above. There’s also a mystery retrigger feature which can award more spins to the luckier players. 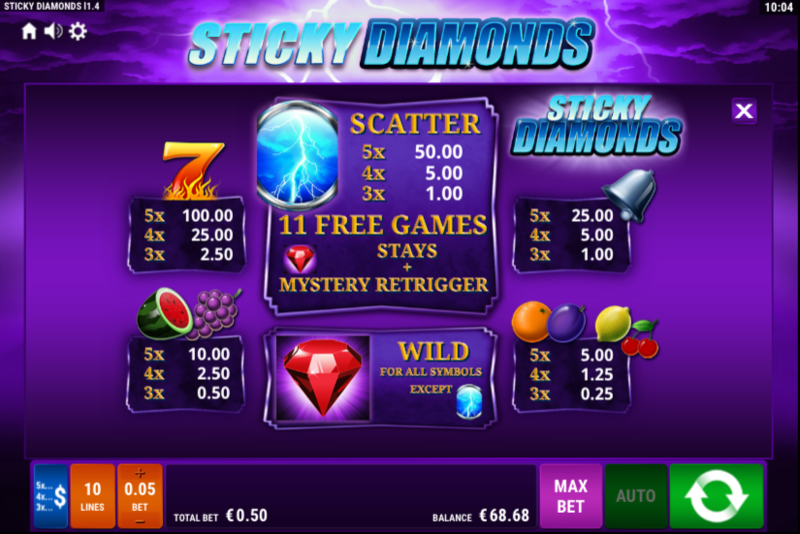 Sticky Diamonds is a very nice-looking game which allies some traditional fruity gameplay with an enhanced free spins round to create an enjoyable slots experience – check it out!